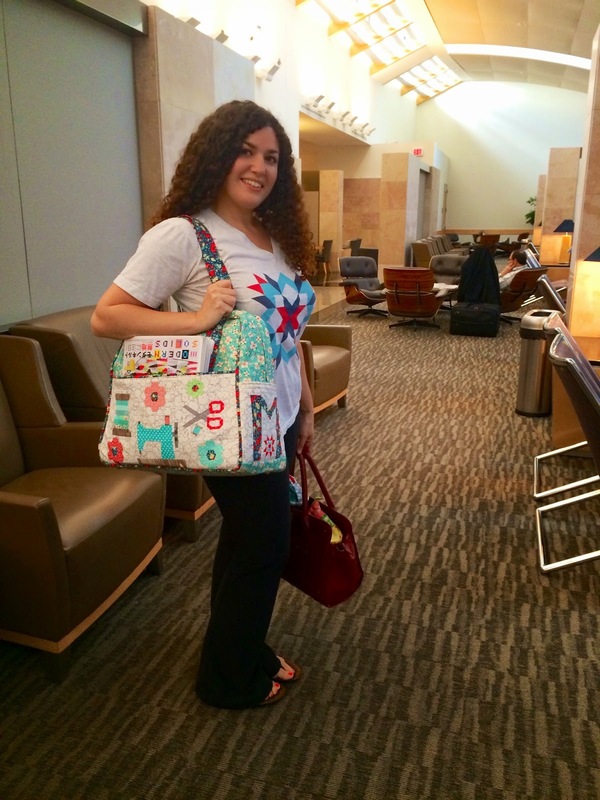 I have had many quilting friends ask me about how I constructed the Amy Butler Weekender Travel Bag that I made for myself at the end of June. 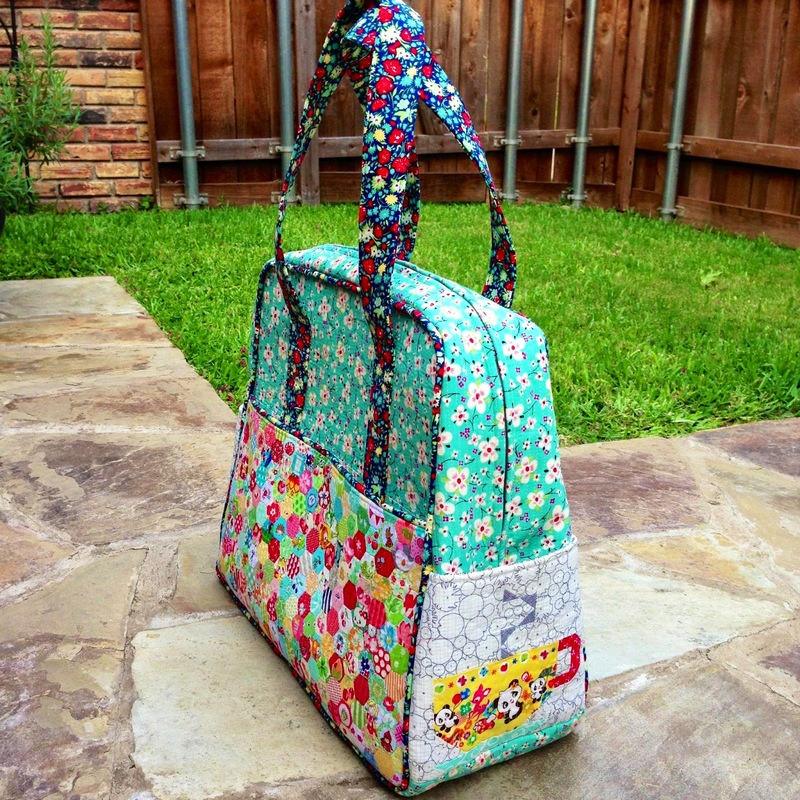 The standard bag pattern calls for home decor weight fabric, interfacing, and peltex, but there are so many different pieced and quilted versions out there. There are also enough blog posts about tweaks people have made to this pattern that this may be somewhat redundant, but I didn't really see any one post that fit exactly what I envisioned construction-wise. First and foremost, I wanted a sturdy, structured bag that would still hold its shape when stuffed completely full. I also wanted batting and quilting on the exterior, but didn't want to break needles due to thickness over interfacing and Peltex. 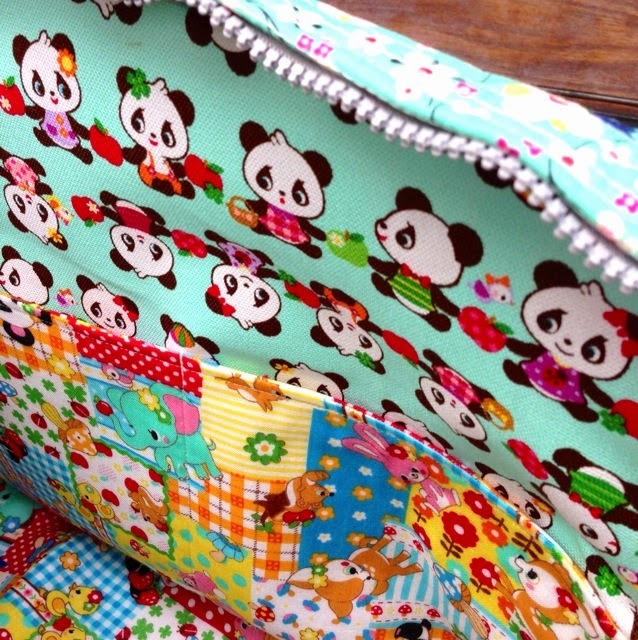 I wanted to incorporate my favorite things into the theme of my bag and some of my favorite fabrics. I am pretty proud of my bag. I love how it looks, and I love that it is so sturdy. I also managed to avoid breaking any needles, so I feel like I was able to manipulate the thickness to keep it from getting overwhelming. I am positively obsessed with English paper piecing hexies, scrappiness, and tiny piecing, so 1/2" hexies from 250ish fabrics seemed like a natural choice for one of the main pocket panels. The hexagons were all hand pieced, either while in front of the TV (thank you, season 2 of Orange is the New Black) or sitting poolside. How I cut and sew my hexies - If I am cutting from my stash, I make a hexagon template with 3/8" seam allowance. I prefer a hexagon shape for anything larger than 1/4" hexies because I don't like the bulk or fabric waste of squares. I then scissor cut the fabric - a quick way to plow through a lot of fabric in a short period of time, and this works well for my fussy-ish cutting - I kind of cut out what I want on the hexie, but if it shifts a bit, that is ok. I wouldn't recommend this method if you want precise fussy cuts. Stitching - I will change up my stitch style when my hands get tired, but most often I use a tiny whip stitch. I also wanted to have a main pocket panel with tools of the quilting trade and added a Thimble Blossoms Mini Spool paper pieced scissors and sewing machine. The hexie flowers are 1/4", hand pieced, and hand appliqued. On one side pocket panel, I used a Spell it with Moda M to boldly declare the bag as mine, and inserted a tiny 2” double star inside. On the other pocket side, I used Kate Spain’s In from the Cold quilt pattern to make a little kawaii mug because I love tea and coffee. Zipper: a light gray 30" non-separating zipper I found at Joann - it is really hard to find a wide variety of zipper colors in this length. I used EZ Steam II to baste the zipper in place before stitching it down. Needle: I switched to a heavyweight denim needle when I started assembling the bag pieces. Straps: My straps are completely different from the pattern. I constructed my straps using 6" x 52" quilting weight fabric. I pressed the fabric on each side in half to the center, and then in half again. I then inserted 1.25" cotton webbing into the straps and topstitched both sides. I love the width and the heavy duty feel, without the stiffness of Peltex. This length works perfect for me to carry my bag over my shoulder. (Way down at the bottom of the page I have included a pic of me carrying my bag on my shoulder). Also, there is a pic below showing how I sewed the straps to the main panels.) To hold the straps into position to sew them to the panel panels, I used a wonder clip on each side at the top and the bottom. Lining: I used a heavyweight oxford cotton for the lining. If I had used a quilting weight, I would have interfaced with Pellon Shape Flex (SF101) - my favorite bag interfacing. Main pocket panel construction: on the hand pieced hexagons, I added sheerweight interfacing to the back of the hexagons to add stability. Both sides have batting and then are quilted every 1/4". Pocket lining is not interfaced. To line up my quilt blocks, I did a little math about what size blocks would work, and I cut the pattern piece out on waxed paper to lay over the fabric, so I could figure out how many hexagons I needed, and to trim my sashing on the pieced side. Top/bottom panels: Quilting weight cotton quilted onto batting. No interfacing. Cording: I don't have a piping foot, so I used EZ Steam II and fused the fabric around 6/32" cording. It took approximately forever to do, but I sat in front of the TV with a small pressing pad and watched TV while I did it. I also used EZ Steam II to fuse the prepared cording to the main panels before sewing the layers together. It was really nice to avoid basting stitches, but again, such a slow process. Bottom and bottom insert: I followed the pattern on this, and I love the result. The bag doesn't bow on bottom even when it is stuffed to the top. Assembling the panels: I skipped using pins and used Clover wonder clips. I used my walking foot to attach. I prematurely high-fived myself after attaching the top/bottom panel to the first main panel; it is attaching the second panel that is tricky at the corners. I had one corner that I had to seam rip four or five times before I was finally satisfied with it. The weekender bag pattern does not include interior pockets, so I added a 9” zipper pocket on one side, and a divided pocket on the other side. The divided pocket panel is the same height as the exterior pockets and sewn down the center vertically. You can actually see where I bled on the lining fabric while hand stitching the lining to the exterior. Oxford cotton lining was HARD to hand sew. My poor fingers, but well worth the end result (and a little Oxiclean removed the stain). Strap stitching - I sewed it down every which way - these straps aren't going anywhere! You can also see how the Peltex is positioned behind the batting and quilted. 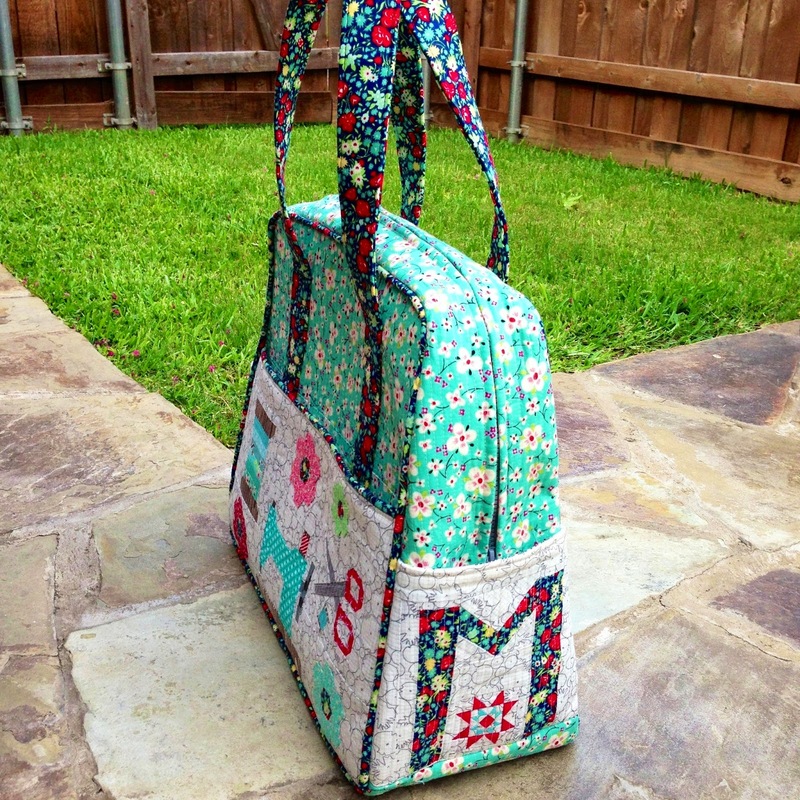 It took me a couple of weeks to piece, quilt, and assemble my weekender bag. I can't decide which side is my favorite; they are all perfectly me. My bag worked very well on our trip, even stuffed to the top (all of that interfacing paid off!). I love your weekender. someday I'll break down & make one.... thanks for detailing all of your tips & tricks! 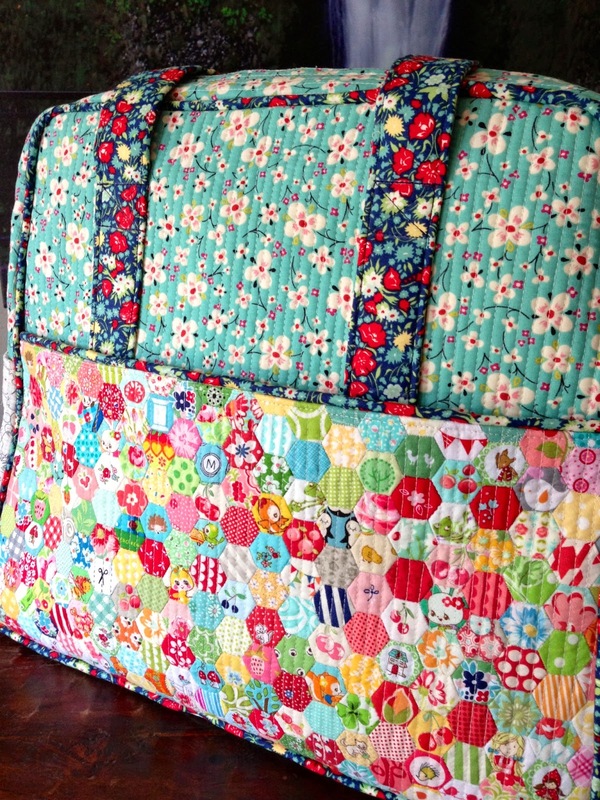 You are a very generous and talented quilter!! After reading all your post ( and the helping words in IGmail) I'm feeling very confident to begin mine!! I'm sending to you a lot of huge hugs from Brazil!! Have a wonderful weekend, dear friend!! Thanks for sharing all your fusing details - I'm about to make a sample one for a class and your hexi pocket caught my eye - I love it!! And I love how sturdy it looks in that last photo. Great job. Thanks! It has held up quite well, even after stuffing under the seat of a smaller regional plane. Such a labor of love, but well worth it.